Card of the Day ~Good Night’s Sleep~ This card indicates that the quality of your sleep is connected to a health concern. Perhaps your mind is busy with worry or your body feels tense due to an excess of stress or caffeine. Regardless of the cause, Archangel Raphael wants you to enjoy a good night’s sleep. When you wish to fall asleep, think about Raphael and imagine talking to him about your concerns. Tell him all of your thoughts, fears, or wishes. When you feel complete, ask the archangel to allow your mind and body to rest peacefully. Raphael will then cover you with his emerald green energy blanket, which will nourish you as you sleep. He’ll watch over you, making sure that you’re safe and protected. It has been my experience that when we don’t get our proper rest our bodies don’t have the opportunity to heal because it’s busy doing other things and putting energy into the activities you are doing. Pain usually becomes worse when you don’t get your rest. There are many natural remedies to aid in sleeping if you have troubles falling asleep. One thing that works is by going to bed at the same time every night and getting up at the same time every morning which; sets your internal clock. Eat healthy, cut caffeine out of your dietary in-take, cut sugar out, drink lots of water, exercise, go for a long walk after your super, drink chamomile tea and the list goes on. 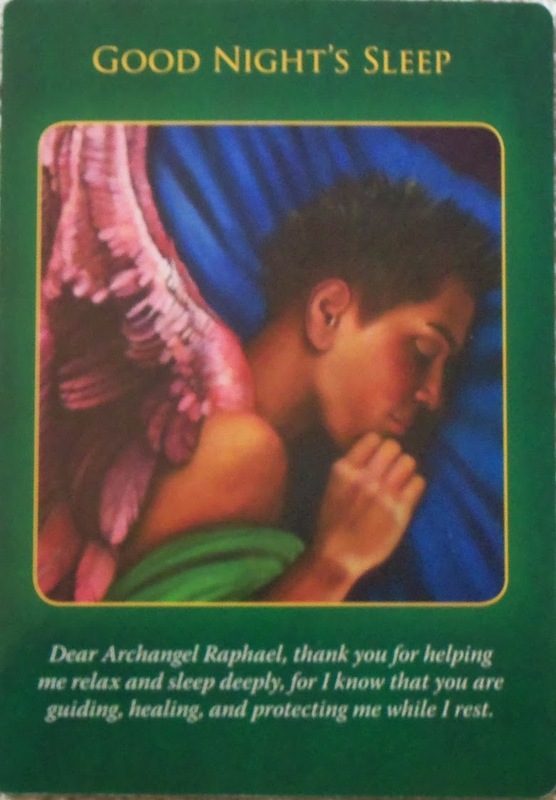 Do your research online for aids to help you sleep as well as ask Archangel Raphael for help. I pray you have a terrific day. I love you all!